Trump says he's setting up a committee. 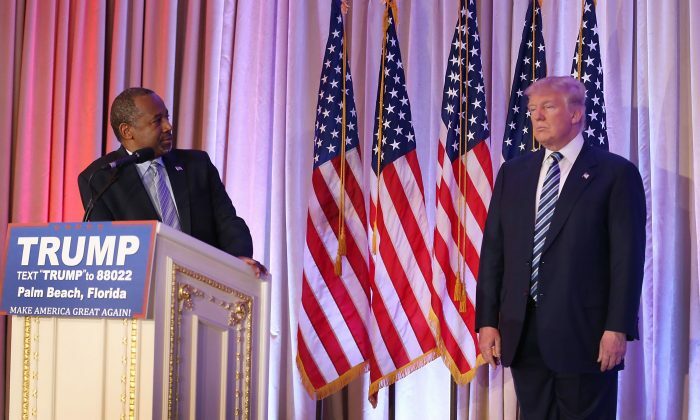 Presumptive Republican nominee Donald Trump said a day after winning the Indiana primaries that he’s going to set up a committee to help vet potential Vice Presidential candidates, and that Dr. Ben Carson is going to be on that committee. Carson, a retired neurosurgeon, made a bid for the Presidential nomination, but dropped out in March. He has since endorsed Donald Trump and been one of Trump’s most recognizable surrogates. A lot of rumors and speculation have surrounded Trump’s choice for running mate. Trump last month, floated the names John Kasich, Marco Rubio, and Scott Walker. Other names that have been tossed around are Chris Christie, Newt Gingrich, and Susana Martinez. This was shortly before Kasich announced that he would be making a statement, with numerous sources reporting that he’s suspending his campaign. In a contrary statement, Trump also said in the Times that Kasich was not on his shortlist. Trump also said that the process for vetting the eventual running mate would probably not be decided until July.